Steiner, manufacturer of high-quality tractors and attachments, has announced the introduction of a new Flex Deck articulating mowing attachment, designed specifically for Steiner 440 and new 450 tractors. 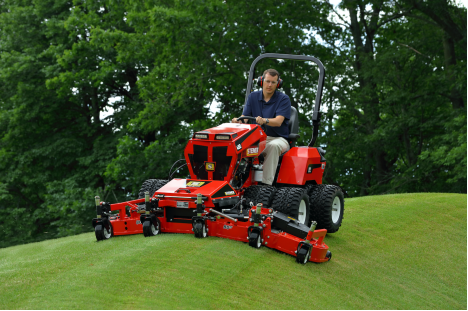 The commercial attachment features four independent decks, designed to follow the contours of uneven terrain. Like the original Flex Deck, the new attachment features an 80-in. cut, large-diameter casters and robust construction. Powered by the Steiner 440 or 450 tractor, the climbing ability and low ground disturbance characteristics enable operators to mow on sloped or soft ground. The Quick Hitch interface of the Flex Deck also allows for exchanging it with other attachments such as Steiner’s aerator or turbine blower in a few minutes without tools. For more on Steiner, click here.